⚙ D16833 [WIP] Further Color Picker Upgrades, Fixes and Refactors. [WIP] Further Color Picker Upgrades, Fixes and Refactors. Authored by emmetoneill on Nov 12 2018, 6:56 AM. 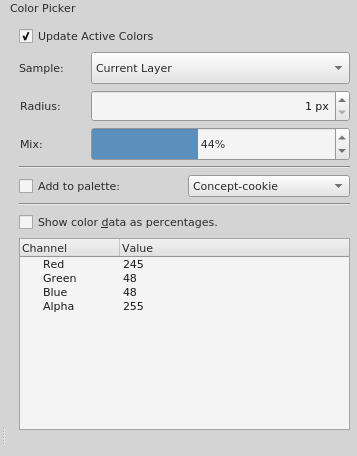 They say you can't teach and old dog new tricks, and so I'm back to hacking Krita's color pickers to fix some things that bother me, to improve others, and to make things a bit more consistent across the various pickers. I've slowed down and tuned the "resample" compression timing a bit while dragging the picker around the screen. This prevents sampling from happening too frequently and makes it easier to control color picker mixing. Tapping once still goes into effect instantly. Both main pickers (the dedicated "P" tool, as well as the ctrl-picker within kis_tool_paint) now share more code and work more consistently with each other. There is still probably more that can be done on this front. Colors can now be picked from Reference Images with both the dedicated Color Picker Tool as well as the Ctrl-Picker. As of now, there are probably a few minor bugs. I've revamped the Color Picker's Tool Options widget. It looks a bit nicer and is a bit better organized. Some related behind-the-scenes code refactoring and reorganization. The growing number of color picker utility functions have been moved out of KisToolUtils into their own KisPickerUtils namespace in the same file. I've changed the Color Picker terminology from "blend" to "mix". 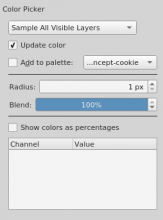 "Mixing" is probably a better description of what's happening, and I think "blending" is too easy to confuse with other things, such as the painting technique as well as things like blend modes. This was a poor naming choice on my part from the beginning, and while I know this has the potential to cause confusion, I think it'll be better in the long run. (Sorry!) I'll also make sure to change this in the documentation before whenever this gets pushed. The dedicated Color Picker Tool's add to palette functionality works again. By default the Paint Tool's ctrl-picker does not share configuration with the dedicated picker. If users want to use dedicated picker settings like mixing and radius from within the ctrl-picker, they must now opt in by enabling a new checkbox (Settings > Configure > General > Tools > "Use Color Picker's tool options for ctrl-picker"). I've added a tool tip to this option that explains in more detail what it does. [Regression?] Normal Ctrl+click in a paint too has stopped working for some reason. Do you have the same? Blending while dragging seem to work. 1.) It's still working for me! Could you double-check your dedicated Color Picker Tool Options? It's possible that Update is not checked or Mix is set at 0% (which is actually a separate bug, as the minimum should probably be 1%)? It looks like I didn't set Update to be checked by default in the .ui file, so that may be what caused the issue. 1.) It's still working for me! Could you double-check your dedicated Color Picker Tool Options? Yes, this problem was something local in the configs. I've reset the configs and the ctrl+click started to work as before. After that I looked at the code and found out a really serious regression: now the "ctrl+right click" shortcut doesn't pick the color to background color (yes, we have a separate shortcut for that), because the destination of the color-pick is read from m_pickerSettings instead of the action type like it was before. Hey again, and happy new year. I went ahead and made the necessary fixes. but without bigger changes to the tool system this is probably as unified as I can make them. dkazakov added a subscriber: Deevad. The controls are really bigger than the original ones for some reason. In color picker tool, when I press Shift, I see no indication. I guess we should show the "pure" mode with some additional shortcut. [not regression] In color picker tool, when changing the mode of the tool from "Sample All Visible Layers" to "Current Layer", the cursor doesn't change. I guess originally, we planned to show different cursors, but for some reason it doesn't work. I agree with @rempt that adding blending into the normal "Ctrl+click" gesture will be highly confusing to the painters. Speaking truly, I would just prefer to avoid adding this feature to the brush tool. If the user wants to blend the colors, he can always activate the picker tool (last work for @Deevad and other painters). Or this option should be available directly in the Brush Tool's options. Otherwise we'll get tons of reports telling that "my color picker doesn't work"
Please don't add Ctrl+Shift+click gesture for "pure" mode. Partially, because of point 4) (it should be an option instead), partially, because this shortcut is used in other places and you'll introduce a conflict. More that that, the shortcut itself is confusing now: it shows an icon of "pick from current layer", but picks from projection; and it doesn't have Ctrl+Alt+Shift+click counterpart. I think it is better just to remove that shortcut at all. Alright, I can make them smaller. I agree with @rempt that adding blending into the normal "Ctrl+click" gesture will be highly confusing to the painters. Speaking truly, I would just prefer to avoid adding this feature to the brush tool. If the user wants to blend the colors, he can always activate the picker tool (last work for @Deevad and other painters). Or this option should be available directly in the Brush Tool's options. Otherwise we'll get tons of reports telling that "my color picker doesn't work"
I appreciate the honesty. Frankly, I'm of the opinion that when the user changes their Color Picker's tool options, those settings should apply uniformly. Does the user really understand that the dedicated Color Picker tool is a separate entity from the Brush Tool's Ctrl-Picker? Do they need to understand these kinds of inner-workings? I don't really think that they do. We could add a global option in the settings menu that enables and disables mixing for the ctrl-picker, if that's what people want. If so, this same logic should apply to radius and other dedicated picker settings in the future. So maybe the option would be something like Apply Color Picker Tool options to the Brush Tool's ctrl-picker.? [Disabled by default]. We could cherry-pick certain picker settings to add to the Brush Tool's Tool Option panel, but this is kind of sloppy and would be just as confusing, if not more. Will the users understand why something that appears to be the same setting exists in two different places? Maybe, but maybe not. Ideally, for me at least, the Brush's ctrl-picker would simply be a temporary invocation of the real color picker tool which would also temporarily append the picker's options under the brush's within the Tool Options panel. Releasing ctrl would exit this temporary mode, popping the picker's options off the Tool Options docker like a stack. But that's probably not going to happen. In lieu of that, however, I do feel that there should at least be consistency across these pickers, both in how they function and how they are controlled. Creating coherence and homogenizing these two separate things is really the central theme of this patch, after all. A big part of the reason the pure mode is being added is to make it easier for people to quickly switch between picking with and without mix/radius, without having to fiddle with their tool options, meaning it's actually more valuable from within the Brush Tool (as the picker's Tool Options are no longer on the screen). This type of things has also been requested (BUG:397889). Anyway, I appreciate the honest and detailed review, Dmitry. If what I want to do diverges too far from the overarching goals of Krita, I hope that we can be frank about that. Made the Color Picker's Tool Options widgets smaller. Got rid of the shift modifier's pure mode. It's not really my ideal, but I can live with it and I hope that's an OK compromise for what you guys want. As always, thanks for the review and let me know if there is anything else that I should change. If not, I'm ready to push the changes. Any idea why this might not be working? I've tried scattering calls to this function across various places (constructor, activation, gui change signal, etc.). Printing debug lines shows me that the code is being run, but useCursor seems to be having no effect. It's probably something simple, but I figured I'd just ask about it. Yes, exactly. People do not link the Ctrl+click picking to the color picker tool. Ctrl+click does exactly what is announced in its description in the shortcuts manager: "Pick Foreground Color from Merged Image". No extra functionality should be available unless there are controls for it right in from of user's eyes. I don't think anyone will use a global switcher. Switching global settings is pain for a painter. He/she will better just paint instead. The settings should either be available in from of the user's eyes, or just not used. As an alternative, you could add an additional "Canvas Input Action" shortcut, which would not be called "Pick Foreground Color from Merged Image", but "Invoke Color Picker Tool". But in such a case, you don't have to refactor any code in the brush tool. You can just temporarily activate the Color Picker tool itself, like we do it for "Draw Line" shortcut. "Invoke Color Picker Tool" shortcut sounds as a sane alternative to it. GUI will show the user that the tool is switched when he presses the shortcut, so he will understand where to search for options. Ideally, for me at least, the Brush's ctrl-picker would simply be a temporary invocation of the real color picker tool which would also temporarily append the picker's options under the brush's within the Tool Options panel. Relsing ctrl would exit this temporary mode, popping the picker's options off the Tool Options docker like a stack. But that's probably not going to happen.